but I am finding so many creative uses for burlap. I definitely want to make a burlap wreath. I think I see a visit to Michaels in my near future. I don't know how I feel about burlap. I like the rustic look of it very much, but it's sort of scratchy. It looks great in all these photos! Thanks for the inspiration, Laura!!! I JUST picked up 4 big burlap sacks at Habitat for Humanity store! $1 each, SCORE!!! To make my burlap wreath, I used leftover from an upholstery job my fried and I did. She bought the burlap for $10 a yard. Also, get a coupon from Michaels, so the ring doesn't cost you $7 like mine did. The little wreath is sweet! but I don't think I would ever decorate with it. It's really in now and a lot of people love it. The photos are very lovely! Happy Easter! 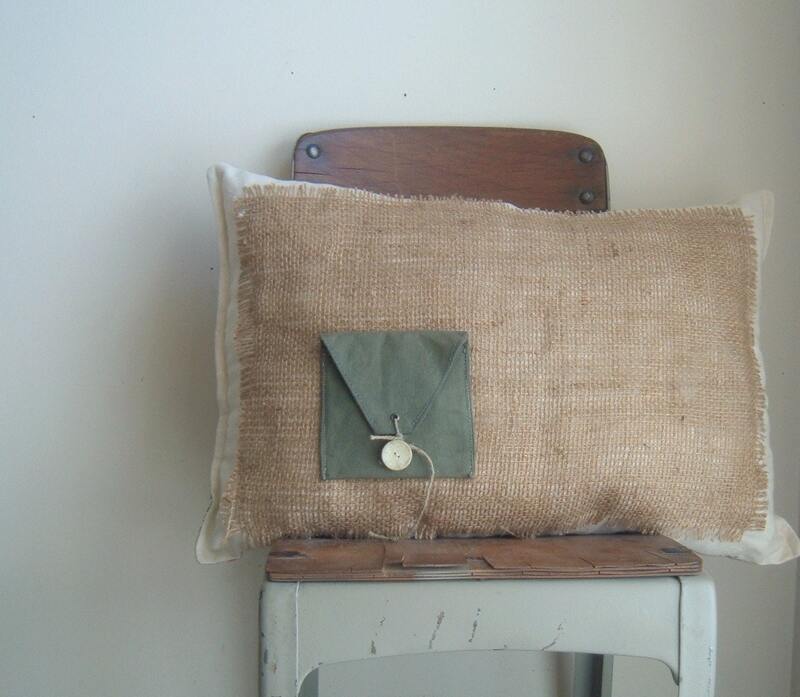 I love the natural color and texture of burlap! The only one I would possibly not do is the one for the bed. At least for the pillows and the cover...bedskirt, definitely! Hope to see your wreath soon! I seem to be allergic or something to burlap. Makes me sneeze! I love burlap too. Thanks for sharing some great inspiration! Love burlap for that farmhouse look and feel. Wishing you a Happy Easter! Laura, every time I visit your blog I am dazzled by your "finds"! I just love the ottoman and eye chart throw pillow. And the burlap skirt in the laundry room had me wishing I needed a skirt somewhere in my house! Guess I need to step away from the stove more often - I didn't even know there was a burlap craze! You made that pillow? wow that looks great like something in one of those high end shops. Good job. I love the look of the burlap, but most burlap I've ever known had an odor to it that I didn't like! Maybe the newer burlap doesn't? Not sure I'd want it as a bed covering. Love your pillow, that is very nice! I love all the burlap especially that wreath. I love burlap I think it adds such nice texture. Love the burlap. but don't like the dust it leaves behind in the sewing machine. Hope you are getting your supplies from Michaels lined up! I've never seen burlap look so cool! Have a great weekend! I LOVE all of the images that you have collected to inspire us! I have been on this whole washed burlap kick since Fall. If you take a few yards to the laundry mat and use fabric softener, it helps rid the odor. I learned about laundered burlap from Andrea at The French Basketeer and Donna at A Life Reclaimed. Your Etsy shop is wonderful! That vintage copper pan...it's patina perfect! I wish the best of blessings to you and your family at this Easter time. My sister is getting into burlap and her house is really lovely!